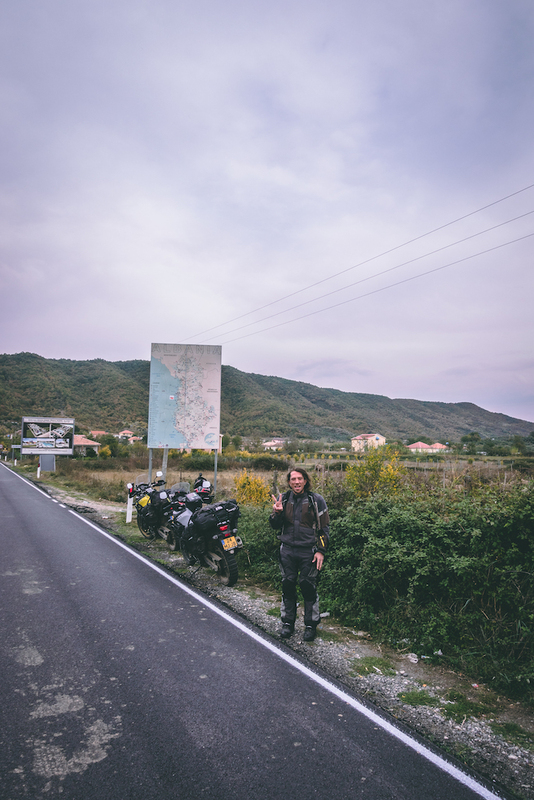 A little background information before I tell you the story of how we crossed Albania in less than 12 hours. Because why would a sane person go to a new place they have never been before and not even stay the night so they can get to know the place a little. Well, this in not just any holiday…. You see, we are on our way to south Africa from Europe. This fact might wow you or not but it is more common than you would think. Anyway, at the time of this writing getting from Europe to the east coast of Africa is a challenge. Syria is still at war with itself and for the same reasons Libya is not safe enough to cross. With the ambition to not fly while we travel from North to South we are left with one option. A boat from Italy to Israel and continue overland from there. Yet this is no ordinary ferry. It’s not like the one you take to cross the canal from Amsterdam centrum to North. That one goes every 20 minutes, it’s quick, it's easy it’s cheap. Even the ones we took from Germany to Sweden, where the distance is a little bigger were regular ferries. You book a ticket for a day and a time and with European precision it will leave at that moment in time. Yet this boat is not to be mistaken with a ferry. This ship is a cargo ship, part of the enormous shipping industry that fuels our global economy. It transports vehicles around the Mediterranean sea and as an exception on the rule has a permit to take passengers on board. So instead of a luxury cruise, you are almost part of the crew. Get to eat the same food as the captains, sleep in a similar cabin and spend the same amount of time at sea. I’ll tell you more about the experience later, the most important fact to remember here is that it is part of the shipping industry. When I was still working at IBM, my first project was for a large shipping company and I worked on digitalising the booking process of a container on a ship. I learned fast that this industry is one of the slowest to adapt technology and is the only reason the fax has not yet died out. Yes ladies and gentlemen, in 2018 there is still an entire industry that relies on the ancient technology of the fax. Besides this, just imagine the incredible coordination it requires to load and unload 500 cars at every port, to make sure they are at the port on time. The right cars get loaded and parked at a spot where they can also be unloaded without being blocked by cars that stay. It’s incredible to think about these processes and how it all seems to work, most of the time. It’s not uncommon for the shipping industry to have delays, since speed is not their main selling point, businesses don’t care if the shipment is late a few days or weeks. So when we called a week before hand if our boat was still scheduled for the 27th we were informed that it was going to leave on the 24th. 3 days early! So instead of 5 days to explore Montenegro and Albania, we now had 3 days. Except that the ferry from Albania only leaves on Monday, Wednesday and Friday which either gives us 2 days or 4 days. But we do not want to risk to miss the boat to Israel so we booked the one on Friday. 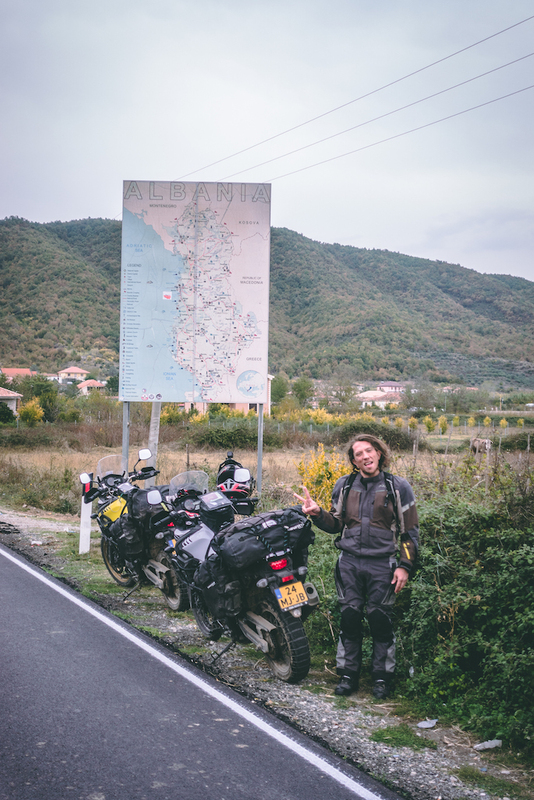 And that, is the reason we had 1 day to ride through Albania. So there we were, just crossed the border looking for a sign to indicate that we made it to Albania. Yet nothing official showed up so we stopped at the map for a quick picture. Since we had a ferry to catch that night, there was only one opportunity to see something of the country. Our lunch break. We parked at the foot of a castle and got comfy on a low wall on the side of the road and watched the world come by. Cars, donkeys, goats… they are still used in Albania. Yet, the most amazing thing happened when an old man came walking by. I have a soft spot for them, I don’t know why but I feel warm and fuzzy inside when a beautiful wrinkled face comes by. So I smile and wave as he glances over and he stops and starts to rummage in his bags. They are full of kakis and pomegranate and he gives me 3 of them. I don’t know how to say thank you in Albanian and later learn that the language looks nothing like the other Balkan languages so trying some Croatian and Russian doesn’t help at all. All I can do is smile and nod my head. I quickly offer him one of our crackers and he politely takes only one. We shake hands and he walks off. Wow, what an amazing experience. We ride on over highways and straight stretches, not the most interesting piece to write about. So when we arrive early at the port we wait it out in a cafe nearby. We read about the Albanian language and history as we prepare to leave. At 7pm we go to the terminal and as we board the ship it’s time to say goodbye to the Balkans. It has been amazing. Now it’s time for our final stop in Europe. Italy! But that, is in the next story.